Freedom Sailors: The Maiden Voyage of the Free Gaza Movement and How We Succeeded in Spite of Ourselves, by Bill Dienst and Greta Berlin. Free Gaza Press, 2012. 237 pages. $15.00 paper, $9.99 e-book. The seemingly endless deterioration of the humanitarian, political, and economic situation for Palestinians in the occupied territories is alarming. It compels a reflection upon what is possible and what could make a hopeful impact. One promising act did occur when a handful of civilians, organized by the Free Gaza Movement, sailed in two small boats from Greece toward Gaza in an attempt to break the Israeli blockade in August 2008. Two years later, a larger group of solidarity activists followed their example, and when Israel Defense Forces troops launched a deadly attack on unarmed civilians aboard one of their ships, the incident drew unprecedentedly widespread criticisms of Israel. The 2010 attack might very well prove to be a turning point in the public view of Israel. Edited by Greta Berlin and Bill Dienst and published in 2012, Freedom Sailors chronicles the path breaking attempt to break the blockade in 2008. It comprises a thorough account of the events, including relevant data, personal reflections, political analysis, and firsthand narratives written by several of the participants. As such it gives us a living description of the difficult and inspirational journey these activists took. Both editors are from the United States and were participants in the action. Greta Berlin, a business owner and cofounder of Free Gaza, was on the boat Free Gaza and Bill Dienst, a family and emergency room physician, was on the Liberty. Organized chronologically, the book’s many primary sources, many of which are original emails and diary entries, offer an intimate look into the project’s history, including both its challenges and successes. We are able to follow the formulation of the idea, the efforts to gather the economic funds, the search for the boat and passengers, and the final preparation of the group of brave pioneers, as well as the dangerous and uncharted journey itself. Several authors are remarkably honest and give clear admissions of how repeatedly their enthusiasm overcame economic worries, group conflicts, a lack of technical knowledge, and a deficiency of managerial experience for a project of this kind. A very human and heterogeneous picture of the participants develops as we can read the stories of the drama at sea. Constant themes include the seriousness and courage of those involved and frequent naïveté regarding possible and plausible outcomes. It is clear that they did, however, understand the dangers. Those that took part on this “ship of fools” knew they were risking their lives for a wild idea and the hope of doing something no one else had done before (p. 24). 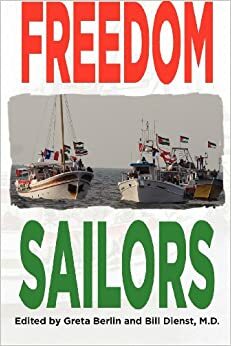 Freedom Sailors is a product of the Free Gaza Movement itself, which received no assistance from a professional publishing house. As a result, it would have benefited from much stronger editing. There are some chapters written by a single author, like the first one by Greta Berlin, that are coherent, dramatically illustrating, and engaging, while others, especially those that combine several authors, tend toward repetition, excessive detail, and omission. Chapters have up to ten authors contributing sections that vary from one paragraph to several pages. The result is fragmentary. However, even without sufficient editing, it is of course a polished text. This book qualifies as an entry into the genre of political memoir, offering an official account of a journey that was problematic and controversial from the first step. But the kinds of (political) choices its authors make are worth noting, particularly their silences. There is, for example, no chapter with critical self-reflections that would assist others to learn from this innovative action. If we are—as I assume the Free Gaza Movement is—interested in how this kind of nonviolent resistance could spread and gain real political force, it would have made sense to include a systematic reflection and coherent analysis of the context: Did this action strategy make sense? What reactions did it elicit from mass media, politicians, and international organizations? How did the 2008 action affect the planning and organization of the 2010 Freedom Flotilla? Furthermore, the 2010 flotilla is surprisingly absent throughout and when mentioned it is framed as if it was the Free Gaza Movement’s flotilla, when in reality Free Gaza joined an alliance of (much larger) organizations from several different countries that did not necessarily agree with their style or ideas. Formulations about “our” flotilla and passengers in a context where the history or structure of the flotilla is not explained suggest unfortunate ownership claims of a collective project that followed their actions. And, these examples are just some of the problematic silences. Instead the editors chose to provide a whole chapter that claims the “real reason” behind the blockade as being economic, motivated by the exploitation of gas from the territorial waters of Gaza (p. 202). That is a strong and possible explanation, but it is only one of several plausible alternatives (for example, the Israeli political project to fracture the Palestinian leadership and territory into two isolated and polarized entities). But more importantly, this chapter does not even attempt to link its economic analysis to the action strategy. In what way activists sailing in boats would affect the colonial project of fossil fuel extraction is never explored. As far as literature goes, Freedom Sailors is not a great book. Still, it is a book I highly and unequivocally recommend. Its significance emerges from the authentic voices and historical documentation of a unique action that made new creative ideas and forms of resistance possible. The actors themselves speak and give substance to their truly inspirational action. It also provides us with an exemplary way forward—but unfortunately we have to draw our own conclusions about how innovative and creative resistance techniques could be followed and made into a movement that really matters for Palestinians. Stellan Vinthagen is endowed chair in the study of nonviolent direct action and civil resistance and professor of sociology at the University of Massachusetts Amherst. He participated in the 2011–2012 Freedom Flotilla with the Scandinavian organization Ship to Gaza Sweden. He is also editor of the Journal of Resistance Studies.